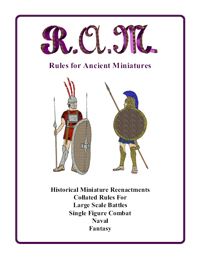 Rules for Ancient Miniatures (RAM). This is a series of rules in one book. Each is a different type of combat. All use the same basic info for types of soldiers. You can play a vanguard skirmish action on Friday night and the main armies on Saturday. Covers armies from 2000BC to 1200AD. No firearms.